When the look had a retro vibe, I though the star totally owned it. 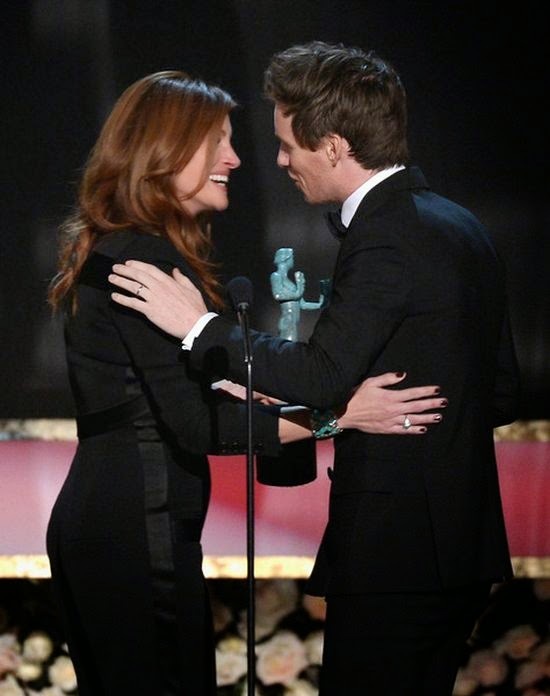 Leave it to Julia Roberts tokeep us on our toes and the red carpet of the Screen Actors Guild (SAG) Awards at Los Angeles on Sunday, January 25, 2015, has proven as a right destination. It seemed quite clear that the 47-year-old is still very much adorable as she wore this playsuit by Givenchy design. With all that dark, we think a lighting set of Tiffany & Co. Jewellery would've done Julia's element to be our favourite, plus her gorgeous long brown hair, it's really simple on sweetheart look. We're not sure what we love more, but please, the actress displayed her timeless structured to no ending while the cleaving on the center theme ensured all eyes were on her. Well done, Sir! Her make-up was landed on soft point and natural flawless with a pair of cute sandals, Lovely! If there was a slight of beautiful west wind which spinning in our heat, We know why!! !